On the eve of a major new retrospective exhibition of her art, Vogue magazine has published an interesting article about the importance of Yoko Ono as an artist in the 1960’s. 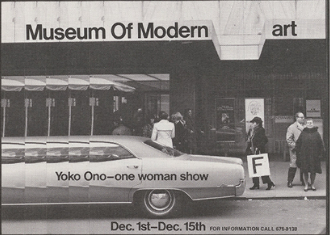 Beginning today at the Museum of Modern Art in New York is an exhibition entitled “Yoko Ono: One Woman Show, 1960-1971″. You’ll notice that the Illy coffee company is a sponsor of the MOMA exhibition. As part of that Yoko Ono has produced seven, limited edition espresso coffee cups as part of the company’s Art Collection series by famous artists. You can learn more about these here. This entry was posted in Beatles, Beatles Related, John Lennon, Yoko Ono and tagged Art, Beatles, John Lennon, Museum of Modern Art New York, Yoko Ono by beatlesblogger. Bookmark the permalink. 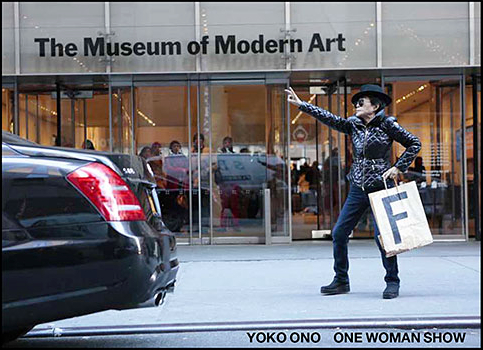 I am sure Yoko has always stood on her own feet. She is obviously original, listen to her sing! I have always admired her for who I have been able to see her as being.